Rajai Aghabi is a European change-maker in wind energy, leading his company EOLOS to produce a breakthrough technology that makes measuring wind 10 times cheaper than conventional Met-Masts. He was an ideal choice for the 2015 EIT Innovators Award. We recently caught up with Rajai to find out what’s happened since his big win. What’s been going on at EOLOS since you won the award? We’ve just completed our product validation stage where we tested EOLOS out on the harsh North Sea for six months, 70km off the Dutch coast. We expect that the impressive results we achieved will soon be published in the official validation report, which we’ll use to finally launch EOLOS on the market. Our biggest challenge now is to introduce EOLOS to the wind energy industry, illustrating the power of our technology and building our credibility. It’s an industry that tends to be conservative and risk-averse, but we have a great product. The prize gave us the financial freedom to attend conferences, pitch potential clients and invest in our network. How did winning the Innovators Award effect you personally? I never dreamed of becoming an entrepreneur, it just sort of happened. So you can imagine all the fears I had when I started the company in 2014. I had plenty of sleepless nights and lots of days when I ran completely on adrenaline not knowing if we could make it. The EIT award validated my decision to move from project manager to CEO. It was a public endorsement of our technology from Europe itself that has reverberated across our industry, opening doors for me. I never miss an opportunity to share the news about our win in a business pitch. I even included the award in my e-mail signature. I’ve learned to become my own best publicist! How and when did you realise there was a gap in the market for EOLOS? Almost everyone in our industry is frustrated by the ‘Met-Masts’ that are conventionally used to measure wind potential on the ocean. Offshore Met-Masts are cumbersome and outrageously expensive to transport and install. 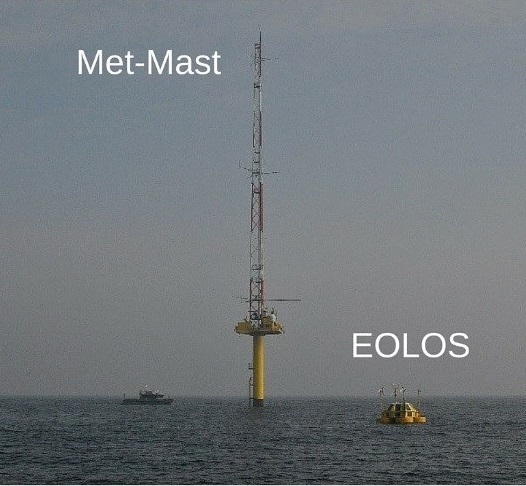 EOLOS blows Met-Masts out of the water. Very funny. Tell me more. Our technology is as accurate and reliable as offshore Met-Masts, but 10 times cheaper. Our clients will be able to access real-time data anytime from our buoys, hassle-free. Transport is easy since EOLOS is relatively light-weight and floats on the surface instead of being fixed to the ocean floor. Given its limited environmental impact, getting a permit is effortless. How and when did EOLOS get started? EOLOS grew out of an EIT-funded project by KIC InnoEnergy that began in 2011, led by the Catalan Institute for Energy Research (IREC) in my hometown of Barcelona. Other partners included the Polytechnic University of Barcelona (UPC), Gas Natural Fenosa, and the University of Stuttgart. We spent three years together merging wind and marine engineering together with system integration, eventually producing the technology that we spun-off to found EOLOS in 2014. I’m the CEO and founder, but I’m not a one-man show. I have a great team of engineers and scientists behind me that are the reason EOLOS won the EIT prize. How does EOLOS promote wind as a viable alternative to CO2 burning fossil fuels? If we are going to beat climate change, the world needs wind power and lots of it. And the ocean is an ideal place to get it. EOLOS makes it far easier and cheaper to identify the exact spots on the ocean with the best potential to generate clean, wind energy. Our technology we help reduce the development costs of offshore wind, fostering its world-wide implementation. Every offshore wind farm in the future will need a product like ours. We’re grateful to the EIT for having helped make our dream a reality.